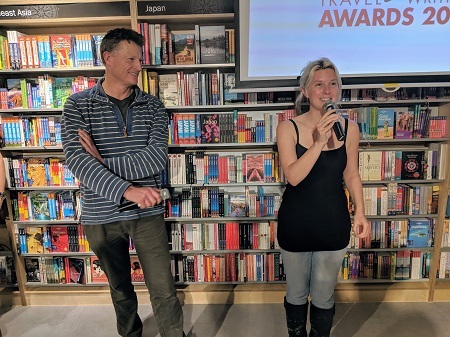 Explorer Benedict Allen and Wanderlust editor Phoebe Smith (right) introduced the shortlists for the Edward Stanford Travel Writing Awards at a party at the new Stanfords flagship branch, on Mercer Walk, yesterday evening. This was an introduction for the trade to the new branch, notably bright and airy by contrast with the more library-like atmosphere of the long-established Long Acre shop. It may get more cluttered: the process of transferring stock continues. Vivien Godfrey, chairman and chief executive, introduced guests to the floor Ordnance Survey maps, which she said would not endure for the 20 years that the Long Acre floor maps had been in place - there will be a rolling exhibition of them. Julian Stanford, six generations down from founder of the business Edward Stanford, unveiled a wall of globes. Stanfords' neighbours in the smart new Covent Garden precinct around Mercer Walk helped out with the party: H&M provided coat racks, and the Temper restaurant offered substantial canapes. For further details about the new branch, see yesterday's story New Stanfords flagship opens tonight. 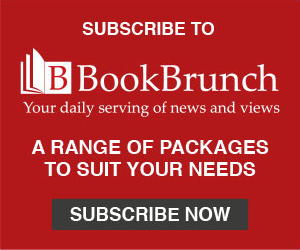 Allen and Smith will be joined on the awards judging panel by author Horatio Clare and Vanity Fair travel editor Michelle Jana Chan. The awards ceremony will take place on 28 February, when the winner of the Edward Stanford Outstanding Contribution to Travel Writing award will also be announced.